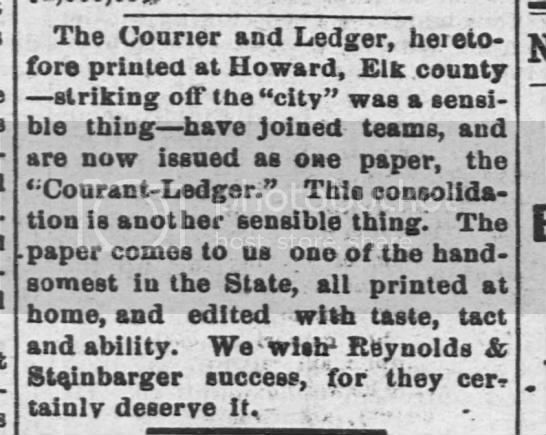 The Elk City Courant moved to Longton becoming the Longton Courant, and then moved to Howard City in 1875 becoming the Howard City Courant upon the division of Howard County. The Longton Ledger moved to Elk Falls becoming the Elk Falls Ledger when Elk Falls became the county seat for the second time and then moved to Howard City in 1876 becoming the Howard City Ledger with Thomas E. Thompson, the 16 year old print setter helping with the move. Tom was formerly a print setter for the Boston Howard County Messenger and moved to Elk Falls after the end of the Boston War for the county seat. Four years after merging, Asa Thompson and son (Thomas E. Thompson) bought the newspaper and renamed it the Howard Courant.